Residential Vinyl, Fence Wood, Pool Safety, chain link, Brick, Stone, Aluminum fences Garden fences or any residential fence you can imagine. Wood is the most natural fencing material. 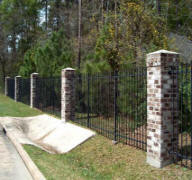 It is environmentally friendly, attractive, and a good choice for residential privacy fence use. 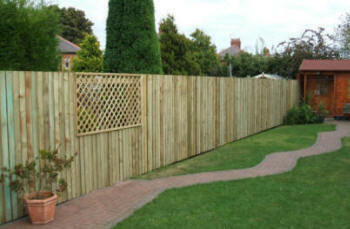 To maintain it's good looks, wood fencing does require more maintenance than other fencing material. But it has a natural beauty that is unrivaled. Designer Properties builds a large selection of wood fence styles to choose from and we can also custom build a wood fence to meet your specific needs. All of our wood fencing comes in ACQ treated wood or the ever popular clear red cedar. 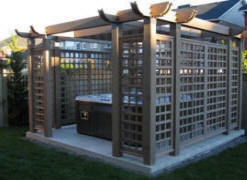 We also offer privacy fences, ornamental fences, driveway and garden gates, vinyl decking, arbors, mailboxes and signs. 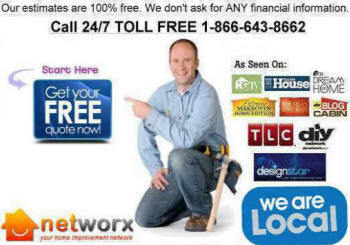 In addition, we can make fence repairs to all types of fences. Because it is not very high it is one of the very friendly wood fence designs and it makes it easy to get to know the neighbors. Conversations over the garden fence can happen spontaneously and without any kind of artificiality. Of course, this can have a downside too – it is very difficult, with a picket fence design, to avoid speaking to your neighbors! You can also easily see who is passing by and who is coming up to your front door to visit, which is good. You need to know how to build a fence and a picket fence is constructed in a particular way. Supporting fence posts, which can have a shaped top to match the pickets, are fixed into the ground at quite large intervals and the ‘pickets’, upright pieces of wood, are held parallel with horizontal bars at the top and also at the bottom. 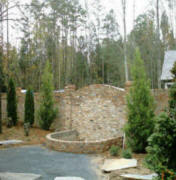 The residential uses of brick can be seen in fences and entries, fireplaces, and structural brick homes. 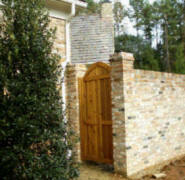 Brick fences & entries add elegance and security to any home or neighborhood. 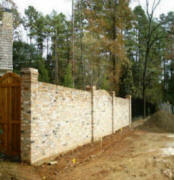 Brick fences are low maintenance and are an effective barrier against sound transmission. Developers who routinely use masonry fences and entries enjoy the benefits of shorter market time, higher margins, and that image of quality. All brick fence designs give the homeowner a lot of color choices whether they use paint or a brick paint There is also the fact that while the color choices are almost unlimited a certain amount of upkeep will be required. Because brick fencing, unlike vinyl fencing or a chain link fence installation, is susceptible to weather and the elements, it will need yearly maintenance and you should expect to have to make basic repairs. Often during the winter months the weather is bad enough to knock down whole brick fence panels, and you need to be prepared for this. 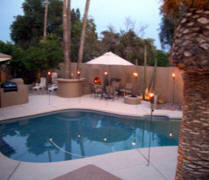 When it comes to custom decks and fences around pools or spas, nobody beats Designer Properties. 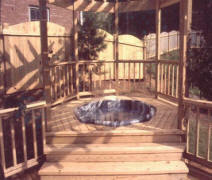 Decks designed to hold spa weight must be designed differently then an average deck, and we know how to make them last! Most of the decks we build around pools & spas are constructed using composite materials, helping to fight against rot and discoloration in high water areas. 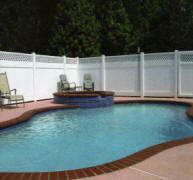 We can incorporate privacy fences, multi-levels or storage areas for pools accessories. 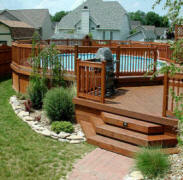 We know how to work around pool pumps and access doors making your new deck function as one with your pool or spa. It will undoubtedly be a sensible move to learn a bit about pool fence designs when you are planning on building a pool fence on your property; indeed, you might actually want to learn how to build a fence. There are very many different types of fence designs and as well as learning about the different fence styles, you might want to familiarise yourself with pool fence installation as well. You can then either build the fence yourself or at least be in a position to keep an educated eye on whichever of the pool fence companies is doing it for you. 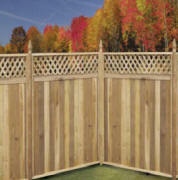 A privacy fence can offer you lots of peace. 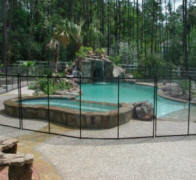 Privacy fences can be made from a variety of materials. Vinyl privacy fence is acceptable, but wood privacy fences are great as well. Evergreen bushes and trees might be a better choice to create privacy. 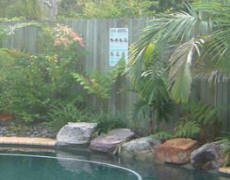 A maximum privacy fence can also be a barrier for reducing noise. This is why a smaller privacy fence near the location you are sitting, sunbathing or snoozing often works best. 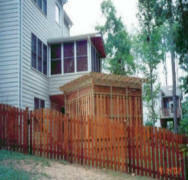 Privacy Wood Fence Systems Wood privacy fence systems can provide a solid barrier between properties. For many people privacy fence designs are probably what they really want when they first think of fence styles and fence installation, and a stockade fence might be the answer. Think carefully though, as privacy fence prices are quite high and it is not a particularly neighbor friendly fence design. If that were to become an issue, a garden trellis fence or lattice fence could be better. These wood fence designs allow for sunlight to favor both sides, conversations to take place and they provide a good backdrop to sympathetic planting. Rail Wood Fence Systems Post & Rail fencing systems use the least amount of wood, making them well suited for larger, more open areas of land. In practice, rail fencing is used to contain livestock or serve as a boundary marker. 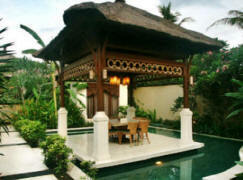 However, because of its rustic style, it's popular in decorative applications as well. A split rail fence is one of the most common wood fence designs and is generally used for agricultural purposes, although on occasion it is used as decorative garden fencing. It is generally use in the countryside and it is the most suitable wood fence for horse fencing, farms and fields and possibly, the garden fence of country houses. It is seldom used in towns. The most common of this type of wood fence design uses timber logs ‘split’ lengthwise to form ‘rails’, hence the name split rail fence. Although you still need to know how to build a wood fence it has a simplicity of design and ease of assembly, needing only a handful of elementary tools. All wood fence designs give the homeowner a lot of color choices whether they use paint or a wood stain There is also the fact that while the color choices are almost unlimited a certain amount of upkeep will be required. Because wooden fencing, unlike vinyl fencing or a chain link fence installation, is susceptible to weather and the elements, it will need yearly maintenance and you should expect to have to make basic repairs. Often during the winter months the weather is bad enough to knock down whole fence panels, and you need to be prepared for this. The pickets can be quite plain or have a shaped top and there are many different picket fence designs depending on individual taste. They can be of varying heights – also within an individual fence if it is custom made – and it is possible to make the fence so that it will look the same from both sides. While a wood picket fence is the traditional way of making these particular wood fence designs it is not the only option. Vinyl fencing has become popular and widespread and it has a lot going for it. It does not need to be looked after in the same way as it is impervious to the weather; it does not need annual painting and it is less likely to rot. Unless you get up quite close to them it is difficult to tell the difference between a wood picket fence and a vinyl fence. The rails are stacked on top of each other, either straight or in zigzag fashion, this is called a worm fence, and vertical fence posts are used to secure them. Because of this, split rail fences are also known as ‘post and rail fences’. The suppliers offer separate end posts, corner posts and line posts with holes made halfway, two holes on adjoining sides and through single hole respectively. Most split rail fences have two horizontal rails, though some suppliers offer three or four if that is what the customer wants. Local Residential Fences Contractors FREE Quote ➨ Local Fences Repair Company Vinyl Fence Chain Link Local Fence Wood Picket Privacy Fence Yard Pools Local Gates Repair. Installed my pool and yard fencing. There are many different wood fence designs and some are more appropriate fence styles for a particular type of house than others, so if you are going to be building a fence it is worth taking a bit of time to choose the right wood fencing for your property. For example a simple picket fence is the best sort of garden fence for a cottage sitting within a cottage garden, while a split rail fence made of red cedar wood goes well with a country style house. It will undoubtedly be a sensible move to learn a bit about wood fence designs when you are planning on building a wood fence on your property; indeed, you might actually want to learn how to build a fence. There are very many different types of fence designs and as well as learning about the different fence styles, you might want to familiarise yourself with fence installation as well. You can then either build the fence yourself or at least be in a position to keep an educated eye on whichever of the fence companies is doing it for you. Within this broad base there are many variations and there are a number of things to keep in mind when building a wood fence. You should choose the correct fence styles for the building and the surroundings; ideally too, they should be the right types of fences for the landscape, utilise the right sort of fencing materials and they should fulfill the function that you require of a fence. 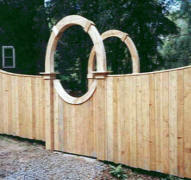 You might want to have wood gates to match. Privacy is often one of the main reasons for putting up a wood fence and this can often cause disagreements between yourself and your next door neighbor. Your garden fence should be built at a height that is reasonable, both for your needs and for what other interested parties would consider acceptable. If it is too low, then neither side will get any benefit from privacy fencing, if it is too high it could be considered to be unfriendly. Fencing materials should be carefully considered when you are deciding how to build a fence and should be in keeping with their surroundings. When first thinking of choosing between the various wood fence designs for your home you will soon find out that there are quite a few different fence installations to choose from and it is important to pick a style that will give you what you need. Privacy fence designs are a popular choice for a garden fence and the idea of a privacy fence appeals to a lot of homeowners when they are trying to decide which types of fences will work best for them. There are lots of things to consider when building a fence and there are many pros and cons to every choice. The following are some examples of both of these. The pros of privacy fencing are quite a few. For starters it is obviously going to provide a lot of privacy as it will not be see through like chain link fencing and it will be much taller than, let us say, a picket fence. The height of a privacy fence is important if you are trying to keep a pet which can jump very high, a dog for example, safe inside the yard. 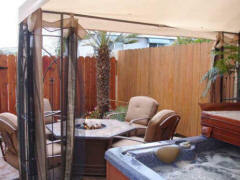 It is also helpful for concealing unsightly items like a shed or camper that is housed in the backyard. The cons of building a fence for privacy include the fact that the same animal that cannot jump over the fence might be more inclined to bark if it cannot see what is going on. It is likely to become agitated if it can only react to smells and sounds that it hears without being able to see what is on the other side of the wood fence. While a privacy fence design offers privacy, it also restricts the view of the homeowner to see what is outside of his or her home. This is something else to consider when building a fence or trying deciding what wood fence design is going to work best for you. No matter which of the wood fence designs is finally chosen, whether it is a privacy fence or some other type of fence design, it should be well made and strong and an attractive addition to the appearance of the home. In order to avoid conflict pre fence installation discussions concerning which wood fence designs you might choose are essential to maintaining good relations. Local Contractors Fence Installation Around Pool Yard Privacy Fencing Picket Vinyl Brick Stone Metal Wood I Need Find Best Home Yard/Pool-Privacy Fences Company Repair/Replace Safety Pools Cost To Install/Build We Install And Repair All Types Of Fences, Stone-Brick Privacy Fence Including Vinyl, Wood, Cost To Install/Build Fences Around Pool Yard Privacy Home Fencing Company Metal Vinyl Stone Brick Wood Fence.